Round 4 of the ANDRA Top Doorslammer Championship has been run in Australia’s southern state of Victoria at Calder Park, and cold weather took it’s toll on the result with the abandoning of runs on both nights. The final on Saturday night was cancelled by ANDRA due to safety concerns on the cold track. John Zappia and Stuart Bishop were due to meet in the final, but a draw was declared and runner up points assigned to both racers. “We got the maximum amount of points under the situation so we earned 97 points and Stuart earned 88 points and we feel we got the moral win,” said Zappia. “We came here to play a game and we won the most points”. 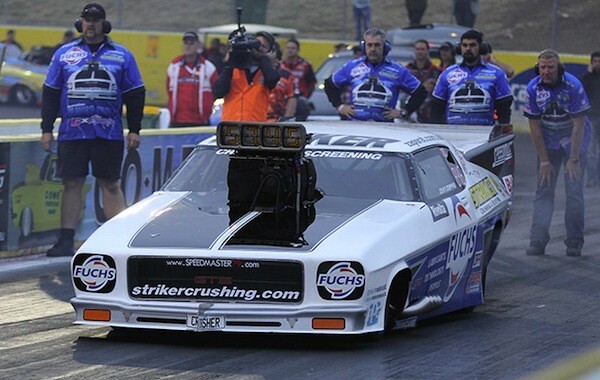 The first qualifier on Friday afternoon saw the Fuchs Lubricants/Striker Crushing and Screening Monaro all over the track and running a 5.55 @ 176mph over the 1,000 feet distance. The other twelve teams also struggled with the track with Stuart Bishop running quickest with a 5.26. “The transition from concrete to asphalt really unsettled the car. It immediately shook the tyres and I had about five pedals and came close to the wall as the Crusher navigated all the bumps”. The second qualifier was cancelled due to very low track temperatures on Friday night, so the second qualifier was run Saturday afternoon. Zappia ran a better 5.27 @ 217mph with a couple of pedals, and Bishop Top Qualified with a 5.13. “The start line concrete was actually very good, so we hotted up the Crusher for the 1st Round against Mark Belleri in the Camaro. The Straight Line Data billet barrel valve and fuel blocks we use allow some excellent finer adjustments. We managed a 1.02 sixty foot launch and ran straight until the transition – where I had to do a quick pedal – then set Low ET and Top Speed for the event with a 5.08 @ 222mph win over Belleri”. Ben Bray 5.26 defeated Dack who crossed the centreline. Bishop 5.15 defeated Fabietti 6.38, and O’Rourke 5.64 holeshot won over Victor Bray 5.62. “We gave the car a little more of a tweek in the tune up to face O-Rourke in the Semi-Final, and we underestimated the track and we were slow in the sixty feet but managed a 5.11 @ 221 win over O’Rourke’s 5.99 with just the one pedal”. Bishop 5.20 took care of Ben Bray 5.74 to book a final against the National Champion but that was not to be. He gained 88 valuable points to lead the Championship with 253, with Zappia jumping to second with 97 points from the weekend to sit at 235 points. “For the Championship we are happy with the result over the weekend. We would have loved to get the win for Fuchs, and Striker Crushing and Screening but feel we did them proud with our team effort”. “We are really looking forward to Round 5 at Sydney Dragway at the X Champs on 2-4th May, as the track there can hold the horsepower we are making and cold temperatures doesn’t affect the track like at other venues”. “The Winters in Round 6 in early June has a killer track as well so we hope to build on the data we get from Sydney”.